The flowering plants are species of plants that have the ability to reproduce sexually through flowers. They have been assigned to the taxonomic phyla Magnoliophyta (formerly anthophyta), which includes two main classes - the monocots and dicots. Covering a wide variety of plants ranging from the massive oak to a small forget-me-not flower. Although these plants reproduce sexually, many can reproduce asexually as well. Flowering plants (magnoliophyta) or angiosperms consist of leaves ranging from colors and different sizes. Roots and stems also vary in sizes. All flowering plants have a vascular system or conducting tissue (such as xylem phloem). Some flowering plants may have petals like daisies, roses, carnations, etc. 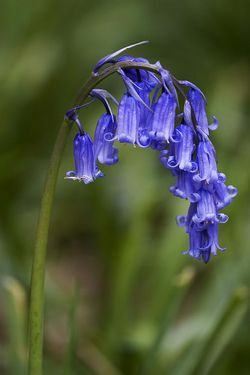 some will be a large towering oak or even a single forget-me-not flower..
Flowering plants have two basic plant systems, root system and the shoot system, but some might just have adventurous roots. The root system allows the plants to obtain water and nutrients through the soil. Most plants have a primary root also called the taproot that has tiny roots branching from it. Some plants may just have tiny roots that branch out called fibrous roots. finally adventitious roots, these roots originate above ground from stems or leaves giving the plant support and a boost. The shoot system includes the stem, leaf, and flower. Most flowering plants have an axis (body) that contains two Fundamental Parts. the stem and the root. There are usually three types of appendages that branch out from the axis. First is leaves that have strands of vascular tissue passing through them in a definite manner. Second is the emergences that are the outer most layer of the stem. The cortex and the epidermis are considered emergences. Third is the hairs that lay both on the axis and leaves with no definite arrangement. 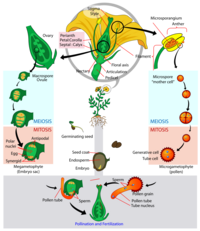 The flowering plants life cycle starts out as a seed with an embryo within it. There are two types of seeds, monocots and dicots. Dicots have two cotyledons while monocots only have one cotyledon (helps store food for the plant). The hard shell outside of the seed is called the seed coat that protects the embryo from any harm. Once the seed submerges itself in the soil it undergoes germination. When a dicot seeds swell up they become soft and the seed coats splits. In a monocot the seed coat does not split. Instead it stays in one piece because the seed coat hardens. Once the seed gets all the nutrients it need a stem called hypocotyl pushes and navigates its way through the soil. Looking for more water and nutrients for the plant, this process is called germination or sprouting. After the plant germinates and sprouts out of the ground it starts growing and making its own food for growth. In the plant's leaves are chloroplasts. The chloroplasts extract energy from the sunlight, carbon dioxide, collects water to make sugar and food necessary for the plants survival. This process is called photosynthesis. The food is then stored in the roots of the plant later to be used. As the plant grows longer, water and nutrients gets transported to the necessary parts of the plant. Whether it be the leaves, flower, or the stem itself. The reproduction of a plant can be sexual and asexual. Flowering plants have sexual reproduction. Once the flower is mature the bud blooms and forms sepals at the base of the flower (they look like tiny green leaves). The flower is the sexual part of the flower with petals that vary in size. The petals help attract pollinators with their strong scents and colors. The flower contains both male and female parts but some can be only male and only female. The pistil (female part) has four parts-- the stigma, style, ovary, and ovules. The stamen (male parts) consist of 2 parts,the long filament and anther, where pollen is made. Located in the center of the flower is a long slender tube called the style. On the top of it is the stigma,its job is to catch and collect pollen. A mountain landscape where Kurdistan flowers and other flowering plants may live in. Angiosperms (flowering plants) are vital for a persons survival. They are a major food source for humans. They serve as consumer goods like building materials, textile fibers, spices, and herbs. They also provide fibres, dyes, timber, fuel, medicines, and ornamentals. Certain plants help with certain infections or as treatment for diseases. Some plants can be used as vitamins, like vitamin C. Plants also provide fabrics for clothes like cotton. These plants often serve more than one function for being water-repellent fibre to an edible oil used in cooking, lubricants, and soap. 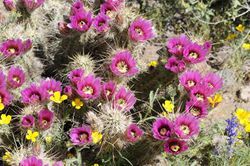 In this videos it describes the life cycle of a flowering plant. To be specific the reproduction of the plant(s). ↑ Ava, Rose. The Stages of the Flower Life Cycle AvasFlowers. Web. January 28, 2018. ↑ The Stages of the Flower Life Cycle AvasFlowers. Web. January 28, 2018. This page was last modified on 28 February 2018, at 13:11.